A wet and windy November day called for a treat and the storm was going to be a lot more enjoyable from The Scarlet Hotel’s warm, dry restaurant. 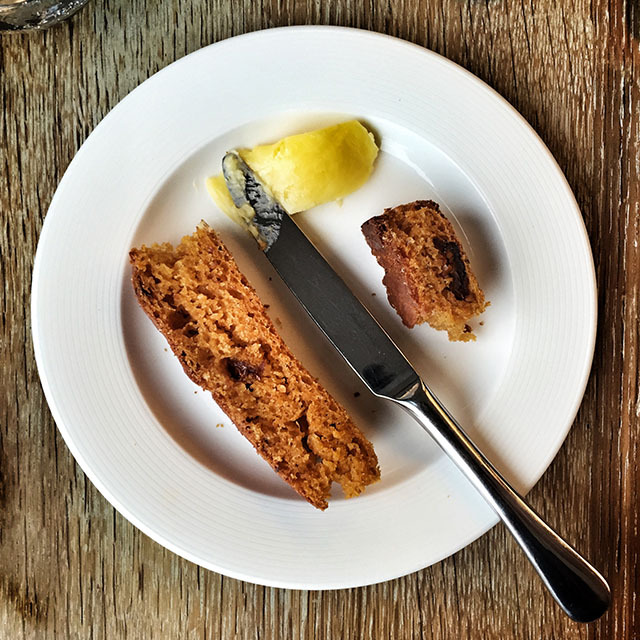 I was lucky enough to be invited to try out Head Chef Tom Hunter’s new Nyetimber lunch menu for locals. Those with a PL, TR, EX or TQ postcode can enjoy a set three course menu, with a glass of Nyetimber champagne, for just £19.50 per person. This offer is available Monday to Saturday, between 1 November and 22 December. 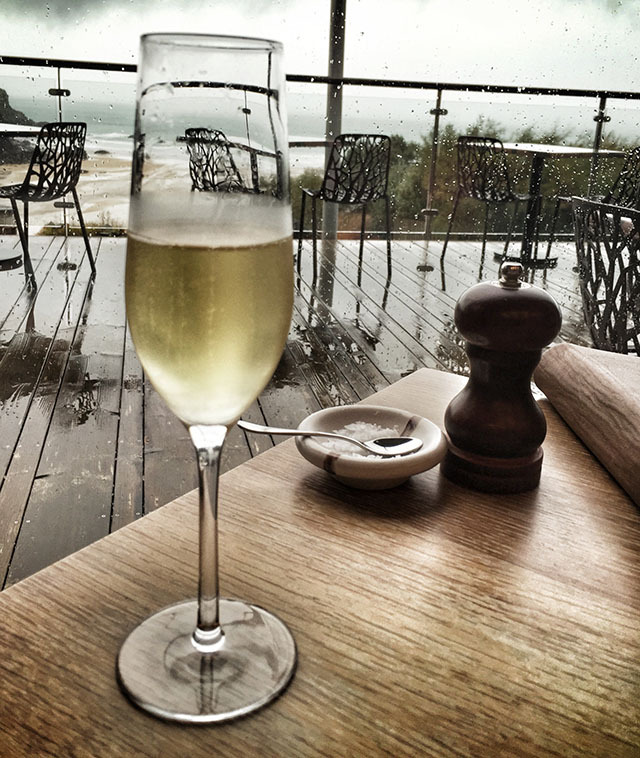 With a stunning view of stormy waves and the rain hammering down outside, the glass of Nyetimber demi sec sparkling wine slipped down very easily, a great lunchtime wine choice – not too sweet and not too dry. If you haven’t heard of Nyetimber, a West Sussex wine producer, then they’re worth hunting out. After sitting down we were swiftly brought a basket of warm bread, including this sun dried tomato focaccia (below), which stopped the wine going straight to my head. With lashings of soft, salty butter, this was a great start. 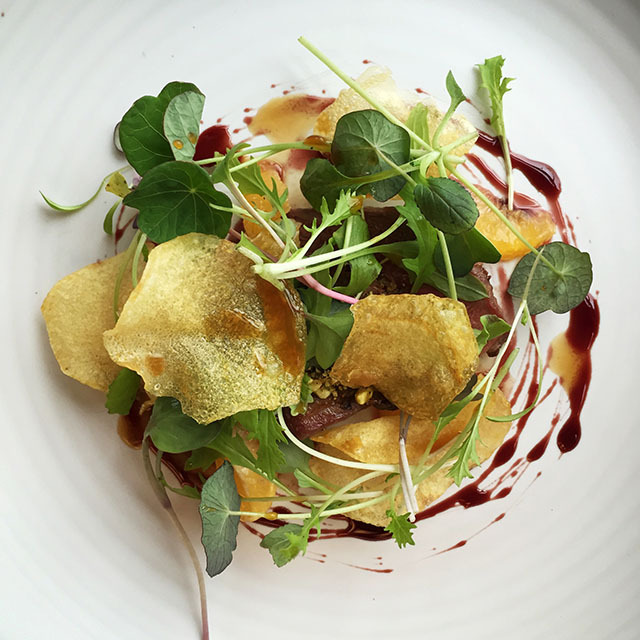 I chose the pigeon starter – pictured below left – Cornish wood pigeon with clementines, game chips and pistachio crumb. Pigeon is one of my favourites and the combination of rich gamey meat with sweet jus and crispy textures of game chips and pistachios worked a treat. 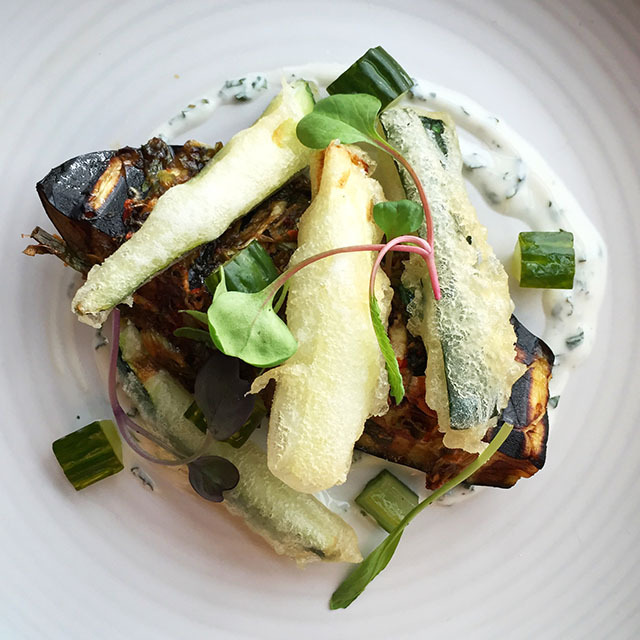 I opted for the vegetarian main course – pictured below right – because I’d had roast pork the night before, and was delighted with the spiced and roast aubergine with zucchini fritters, mint and yoghurt. The spices built up over the course of the dish and the sharpness of the little pieces of pickled cucumber brightened it up. 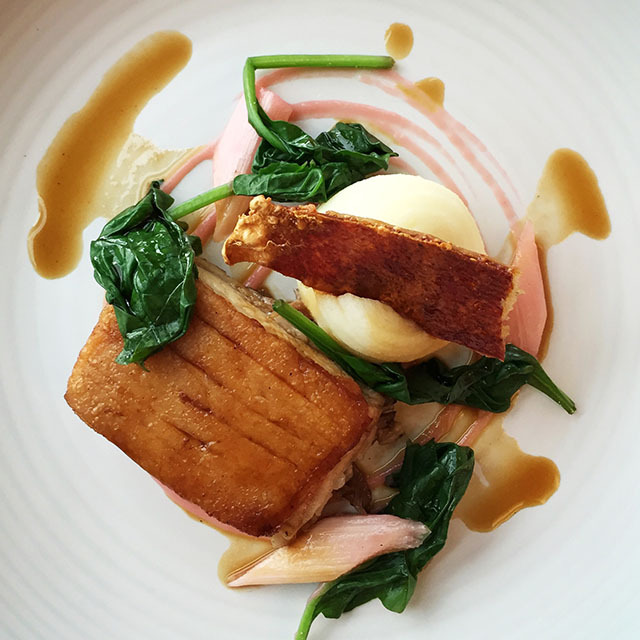 My friend’s main course – pictured above left – was the Primrose Herd pork belly with rhubarb, mash and young spinach. The mash was smooth and creamy, the pork was so succulent that it just fell apart, and the sharpness and sweetness of the rhubarb worked really well. 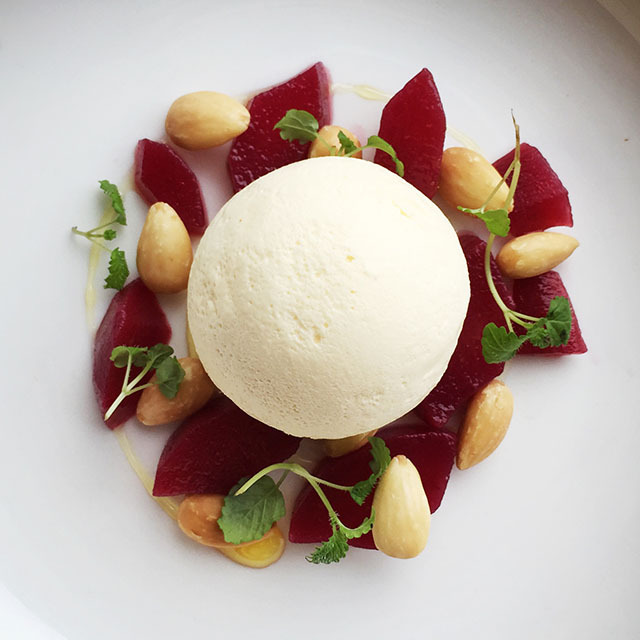 For dessert – pictured above right – my friend chose the honey parfait with blackcurrant pears and toasted almonds. Pretty as a picture, and a perfect combination of flavours and textures. 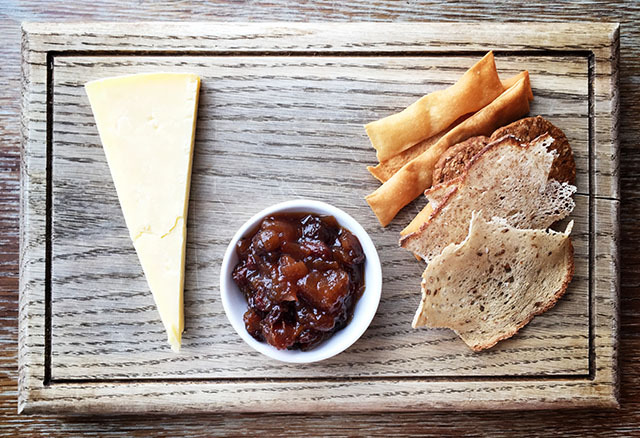 I was very happy with my cheese course – pictured below – Keens cheddar with pear and saffron chutney. The homemade biscuits were a delight and the chutney and cheese were very well balanced. As I left the hotel the sun decided to reappear, making my departure from the peaceful, warm haven of The Scarlet slightly less painful. I can highly recommend a visit to The Scarlet if you haven’t yet been. Thank you to the staff for looking after us so well. 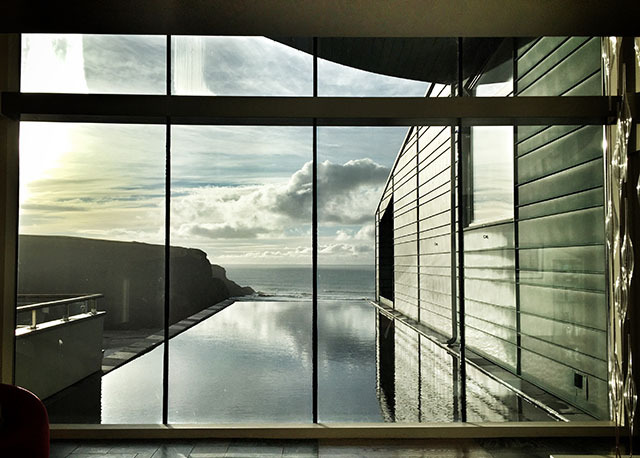 For more details see www.scarlethotel.co.uk/nyetimber-locals-lunch-offer. To book phone 01637 861800 or email [email protected] or book online.